"The trip was a wonderful experience and we hope to do a lot more travelling in the very near future! " They travelled with Exoticca in August of 2018. Two of the best weeks of my life! 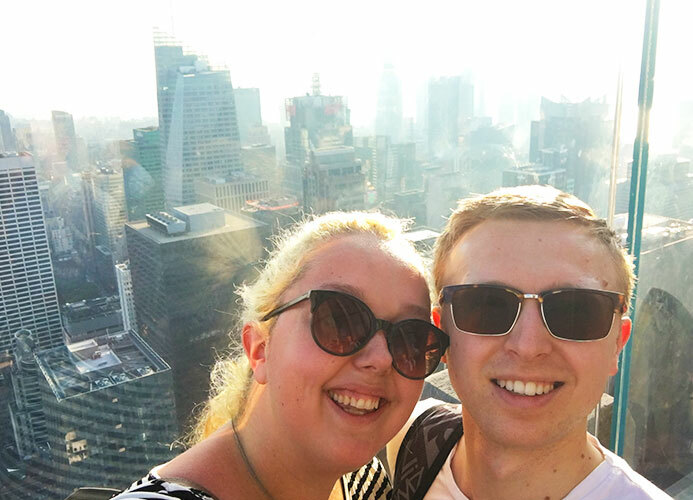 My boyfriend and I were keen to start travelling more together and after seeing this trip on Travelzoo we decided it was just the kind of adventure we were looking for. What appealed to us most is that the trip combined two very contrasting locations; the busy metropolis of New York and the tranquil rainforests of Costa Rica. It was to be the biggest trip we had ever done together so we were really looking forward to the new experiences. The trip itself was perfectly organised and everything was made very easy and simple for us, we had nothing to worry about in terms of timings, transfers and excursions. The guides for all of our trips were very knowledgeable and friendly people and after the first couple of organised tours, we relaxed knowing that everything would be taken care of for us. Emma and her boyfriend at the top of the Rockefeller Center. We had such an amazing time in New York. The hotel was situated perfectly for sightseeing and we had a busy few days there, enjoying the excursion to the top of the Rockefeller Center, which I think has even better views than the Empire State Building. We also booked two Broadway shows on our own and really loved being immersed in the hustle and bustle of the Big Apple. We would recommend taking the city’s tourist bus for an easy way to get around, see all of the sights and get a good overview of the different neighbourhoods. 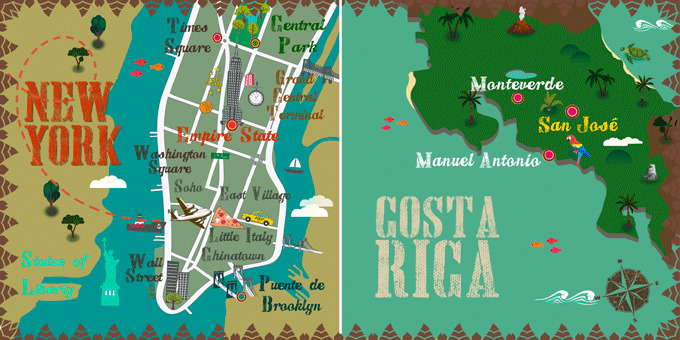 After a busy time in lively New York, we took a flight down to vibrant Costa Rica, the part of the trip we were most looking forward to. Although it was technically rainy season, we were blessed to only see a couple of rain showers and the weather was comfortably in the mid-20’s for the duration of our holiday. We were really pleased with the hotel choices in Costa Rica, each of them was well above standard with their own unique charms and most were well located too. Costa Rica is famous for its wonderful wildlife and we were impressed by the variety of animals we saw on the trip, including colourful birds, monkeys, insects and the iconic red-eyed frogs. 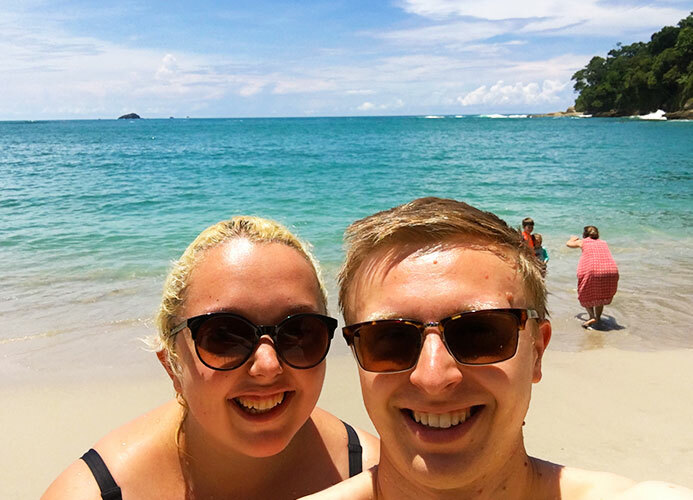 The beaches were absolutely stunning, especially the one in Manuel Antonio National Park, which was simply idyllic. Emma in Manuel Antonio National Park. The Skywalk excursion in Monteverde was an unforgettable experience. We walked across stretching treetop bridges that revealed incredible views across the island, especially so on the day that we visited as the weather was clear and bright. The activity centre here was great and you could easily spend a day there exploring the rainforest and taking part in the numerous activities. 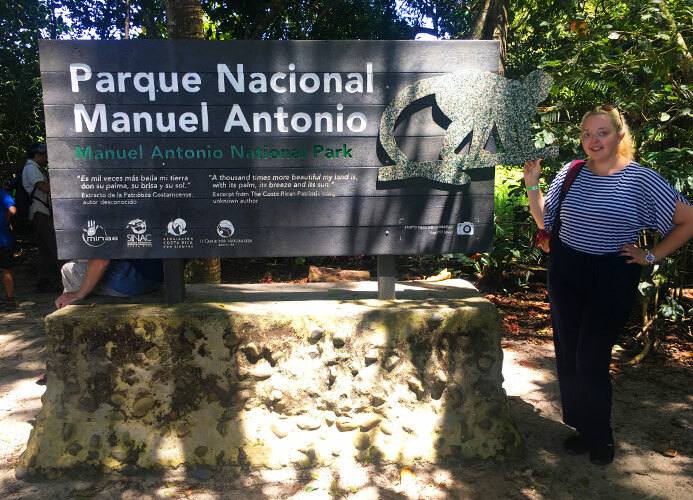 Our most memorable moment from the whole trip was in the Manuel Antonio National Park, watching Capuchin monkeys playing and swinging from branch to branch, just above our heads; it was a very special moment! The wildlife made such an impression on us that we brought a beautiful hand-painted picture of a Costa Rican tree frog which is going to sit on the wall in our front room back home! Another thing to say about Costa Rica is how wonderful and fresh the local food is. The fresh fruit is unbelievable and served with almost every meal. You can eat really well there and I fell in love with the local dish, Gallo Pinto, which is a delicious breakfast dish of rice and beans, garnished with several other tasty ingredients depending on the region. I would return to Costa Rica in a heartbeat, as it is such a beautiful country full of friendly people and a laid-back atmosphere. The trip was a wonderful experience and we hope to do a lot more travelling in the very near future! Emma and her boyfriend on the beach in Costa Rica. The fruit in Costa Rica is so unbelievably fresh, I recommend treating yourself to a sunset Pina Colada cocktail, made with fresh pineapple! Take good walking shoes, both for rushing around New York and for the nature hikes in Costa Rica. This traditional Costa Rican dish is so flavoursome, you mustn’t miss out on it while you’re there. On a trip to the USA, the variety of landscapes you can discover is spectacular, with contrasts aplenty, ranging from the urban metropolises of Los Angeles and San Francisco to the Great Plains, the deserts of Monument Valley, or the giant Sequoias of Oregon and California. Not forgetting the wild wildernesses of Alaska or the exotic Polynesian islands of Hawaii. There are also as many different lifestyles in the USA as there are landscapes.